The replacement of a biliary catheter and the Boeing 737 Max: An example of a system failure? The replacement of a biliary catheter and the Boeing 737 Max:: An example of a system failure? A 60-years-old woman had a diagnosis of colon cancer with liver metastases. During her follow-up the bilirrubin level increased and a sonogram showed a common bile duct obstruction. At this point shereceived a palliative treatment with an internal catheter to solve the obstruction. A year after, the bilirrubin level increased again and the vascular radiologist decided to replace the old catheter what was obstructed at that time. The patient was allergic to the iodine contrast and she had to receive premedication twelve hours before the procedure with prednisone. The anesthesiologist examined the patient and he wrote orders in an electronic format, but he only informed to the first attending doctor. The nurses were unaware of this situation and the patient was attended for at least five doctors during a period of a week. The first doctor wrote the indications in the electronic evolution, but no advice was communicated the next day to the new doctor attending the patient. Moreover, when the patient was scheduled for the intervention, in two occasions an emergency in the Radiology Department delayed the procedure. The new appointment was scheduled on a Monday morning, but there was no communication during the weekend to the doctor in charge of the patient or the nurses, and she was not treated with prednisone before the procedure. Failure of the procedure: The procedure was delayed three times. – The anesthesiologist wrote the indications clearly, but only the first doctor attending the patient knew the advice. The last doctor in charge of the patient was not aware of these special indications. – The nurses were not informed of the recommendations before the procedure. – No one was really in charge or under control of the procedure, either the radiologist or the physician attending the patient. – No update of the checklist was made by the radiology department, after the delay of the procedure. Patient role: the patient knew about her potential allergy, but she didn´t speak at all. Who was responsible for this situation? After a discussion in a group with the doctors involved, all of them blamed to the last one who saw the patient. They considered that the doctor in charge of the patient should know every written detail on the clinical follow-up. Do you agree? Do you think that the radiology department should organize the whole process? The recent accident of a Boeing 737 Max share, in my opinion, some common aspects with this clinical exercise. The plain has too much energy during taking off and a new software was designed to put the nose down again, but if the pilot was not familiar with this situation, a wrong maneuver could originate an accident. The information about what to do was perfectly described in the “Instruction Manual” of the plane, but not every pilot was informed of this scenario. Do you see some similarities? We have developed a first graphic analysis for the case , using a “Fishbone” diagram. 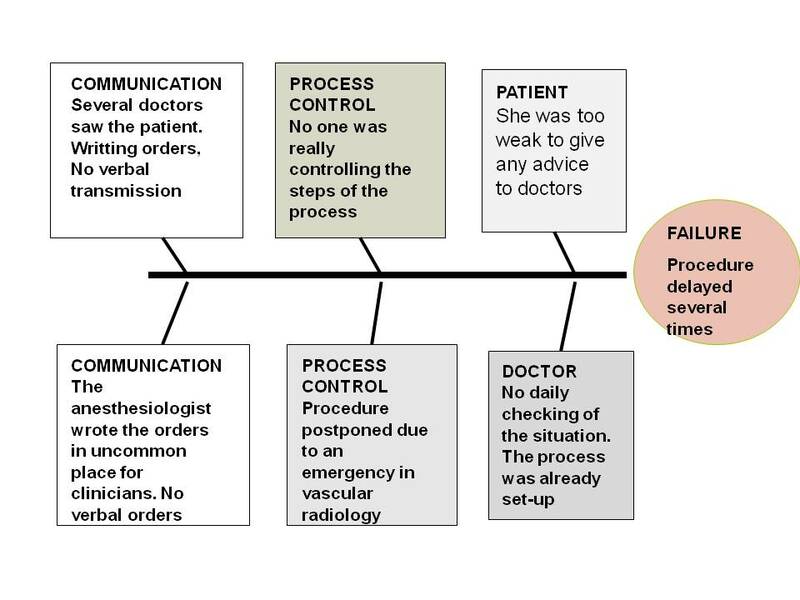 Verbal communication of uncommon rules for a procedure is mandatory, even if the indications are written in an electronic format. Every procedure has to be clearly described , the checklist evaluated every time and a person has to be in control of the key points. Taking in consideration the opinion of the patient is always an important step for the safety of the procedure.